We've filled you in on several all-important fashion items and what makes them look cheap, including skinny jeans, shoes, and handbags. This time, with spring and summer quickly approaching, we think it's the ideal time to talk about sandals—the official footwear of May to September—and what it is that makes them look cheap. And we couldn't have landed a better expert on the subject—Christina Martini. Martini is the designer and co-founder (along with Nikolas Minoglou) of Ancient Greek Sandals, the holy grail of perfectly pared-down, gorgeous sandals since its inception in 2006. The brand's handmade leather sandals are stocked by practically every luxury e-tailer, and they have garnered a loyal celebrity following. To answer our inquiry about what the telltale sign is of cheap sandals, Martini told us that it's all about the leather. She said, "Quality raw materials and careful production are definitely the most important factors when looking for the perfect leather sandals. Many 'cheap' sandals are made from synthetic leather, which you can tell by touching, or even by their smell. If the material is cold and has a plastic smell, it is better to avoid buying them, as this leather may well stretch out of shape, or even snap. Real leather always feels warmer to the skin and won't make your feet sweat." While the quality of the leather is of utmost importance, that's not all. Martini also pointed out that a cheap sole is another dead giveaway. She remarked, "Something that can also make sandals look cheap is the sole: [Foam] Eva soles, usually in light brown, are widely used on leather sandals and they are unlikely to last more than one summer, as the sole will often come apart from the rest of the sandal." And lastly, Martini advises steering clear of poor stitching and plastic or metal zips, both of which can cheapen a pair of sandals in one fell swoop. She adds, "Stitching, when executed badly, can make sandals look cheap, and in general, we try to use stitching only when needed." The beauty of Ancient Greek's sandals is they're made with the highest-quality materials by expert craftsmen yet they won't break the bank and will age beautifully for years to come. What more could you ask for in a pair of sandals? Many 'cheap' sandals are made from synthetic leather, which you can tell by touching, or even by their smell. How pretty is this raffia detail? We're dying to wear these to a summer wedding. Get on board with the statement heel trend. 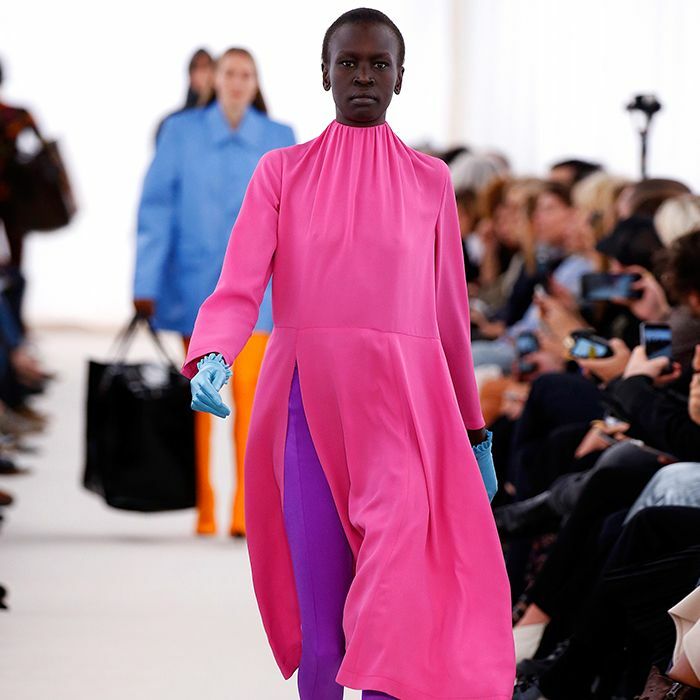 Acne Studios always serves up the best pink shoes. Stitching, when executed badly, can make sandals look cheap, and in general, we try to use stitching only when needed. You can't have too many pairs of on-trend white shoes this season. Everyone is talking about this new brand. Yes, these are really only £22. Behold the It colour of spring. Here's yet another pair of gorgeous Gucci shoes to covet. Croc embossing is an expensive-looking detail. Something that can also make sandals look cheap is the sole: Eva soles, usually in light brown, are widely used on leather sandals and they are unlikely to last more than one summer, as the sole will often come apart from the rest of the sandal. They're rose gold… need we say more? 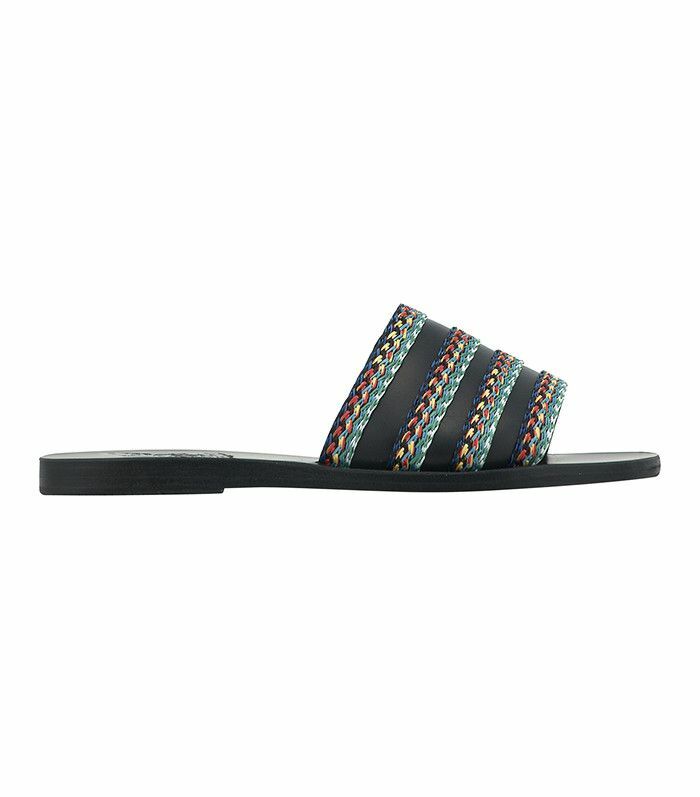 You'll wear these versatile sandals on repeat. 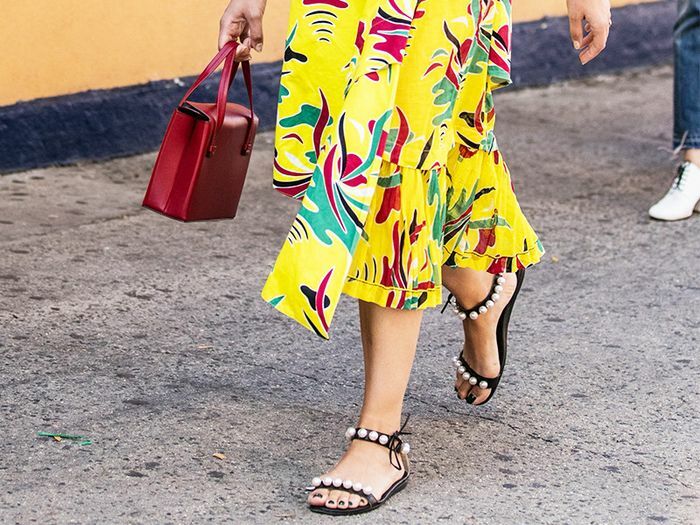 Proof that black sandals don't have to be boring. We're all about that sliced heel detail. Guaranteed to instantly spice up your jeans and tees.